Figs. 1, 2, 4, 5. Larcospira quadrangula. BSS 28B(II), IOW 134(F), BSS 28B(II), and BSS 32B(F) EF Y55. Fig. 1: oblique polar/frontal view, figs. 2, 4, 5: frontal views. Fig. 2, from the Indian Ocean plankton, is a "juvenile" specimen; note the fully developed support beams. Figs. 3, 6. Tetrapyle larnacilla. BSS 28B(II/676) and BSS 26B(F) EF P44. Fig. 7-10. 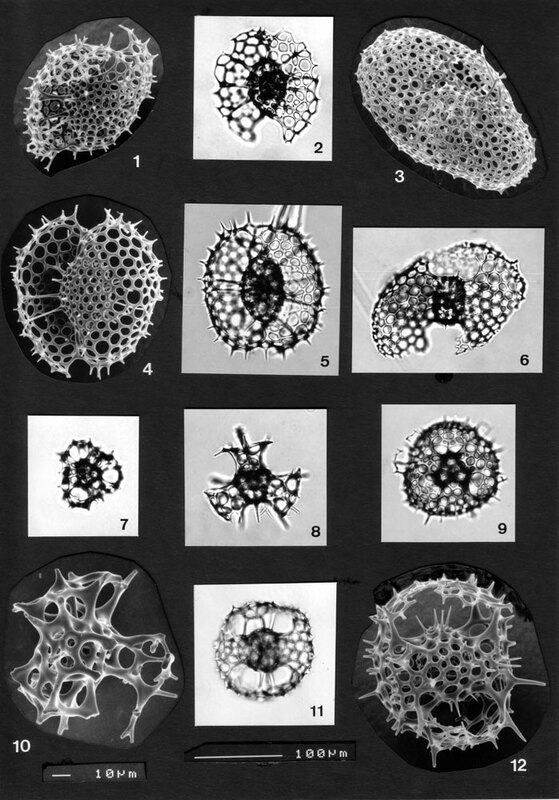 Different sizes and morphologies of Hexapyle armata. with the central structure in detail in fig. 10. IOW 112(F), BSS 61B(F) EF 42, BSS 25B(F) EF W29 and BSS 28B(VIII/1052). Figs. 11, 12. Tetrapyle octacantha IOW 188(F) and BSS 28B(II).